« I’m back! Now with 20% more flavor! You know what makes me sad? The are only 4 photos in my 2009 WiPs set on Flickr. FOUR photos and I haven’t finished one project! In all fairness the first half of this year was insane! However, I’m taking some steps to taking by my time, including saying no sometimes. 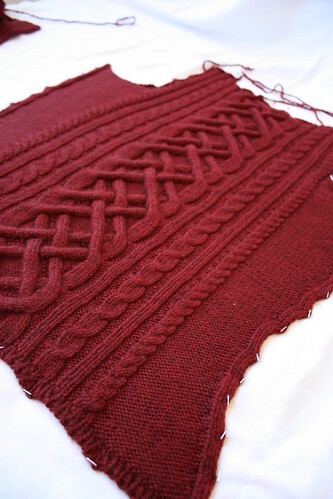 I’ve been working on the Seeded Cables Cardigan since January according to Ravelry. Not sure when I’ll actually get to wear it down here, but I know it will love it. The back and right front are done, I’m almost done with the left front. So close! I will finish it by the end of August! It looks great! Wondering if you’d be able to help me with the beginning portion of the pattern. I’m having trouble figuring what the Set up row for the left corkscrew cable means. In the book, it’s a pale green row but I’m not sure if that’s a knit or purl row. Also, does it matter if I don’t CO with a tubular CO. I did it the regular two-needle cast on. Any help you can provide would be greatly appreciated.